I AM GOING TO THE DOMINICAN REPUBLIC...... FOR 2 MONTHS!!!! Say what?? Yep, that's right. I am super excited for this trip and I can't wait till the day arrives (leaving June 2015). I haven't traveled to my native country for ages, people, or been on an airplane for a long time too. Just didn't have the desire to go or perhaps the yearning to experience the world as I do now. I've always loved traveling, don't get me wrong but this moment in time is when I am most happy about it. I am older, wiser (I hope) and a lot more prepared. I LOVE everything traveling allows you to do. Visiting new places, discovering cool things, meeting new people and if you're like me, packing. Ohh, boy do I love to pack... Is that weird? 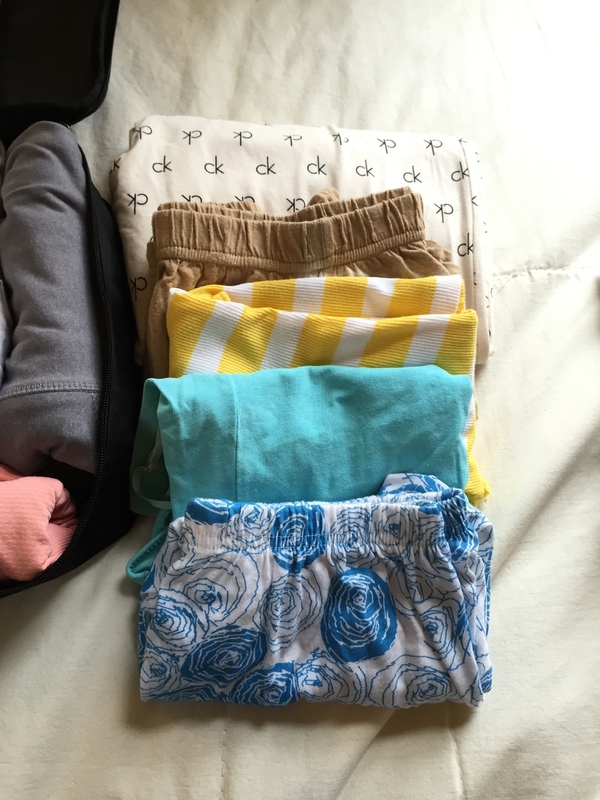 I'd say I'm a very organized packer because I like to spend time planning what I'll be bringing on my trip and how I can maximize the space in my luggage. After intense research, I've recently decided to get the Samsonite Bartlett 29'' Spinner suitcase in Black. This piece of luggage is built to last, and the price is also relatively doable. I did get a good discount for it though. The exterior looks classic and clean, with 1 large zipper compartment at the front that runs the length of the suitcase and another one just below it for your phone, passport or smaller items. The interior? Takes the cake. It is SOOOO spacious, with built in shoe holders, a mesh compartment for smaller items and a zippered compartment along one side. I also got both the 20'' and the 24'' models to suit me for shorter trips. Samsonite Bartlett 29'' Spinner suitcase, 24" and 20"
Since I am going away for two months I have to check in luggage (in order to accommodate all my stuff) although I highly recommend you don't for shorter trips, (say 2 week trip) because it saves you so much valuable time at the airport if you squeeze all your things in a carry-on. Can be a bit difficult I know. ** These are suitcases 24'' or bigger as those are the ones usually too large to fit in an airplane's overhead compartment so you are obligated to have them checked at the airport. It must not exceed 50-56 Pounds. Packing Cubes in different sizes (I absolutely love the Eagle Creek Pack It System) I got mine at the container store, currently 20% off. Shop Now: http://bit.ly/1dLkh7N Our best-selling Eagle Creek™ Pack-It™ Folders are essential to organized travel! They keep everything from suits to shirts neatly folded, compact and wrinkle-free. Stretch wings ensure a tight fit that prevents shifting (which causes wrinkles) and allows to you to fit even more in less space! Lay out all your clothes/outfits + every other item/product you'll be packing (or you can just scatter them on your bed with no regard to organization). That works too! Prior to anything, I like to make sure my clothes are clean and smelling fresh. If they are not, I wash them before packing. The truth is I want to avoid having to do laundry the first few days during my trip. I like to reserve the clothes I'm wearing on the plane first. I lay out all the clothes I'm planning on taking on the trip + every other product I'll be packing and categorize each pile by item. (Not pictured but I did eventually tackle that load of clothes on the bed). 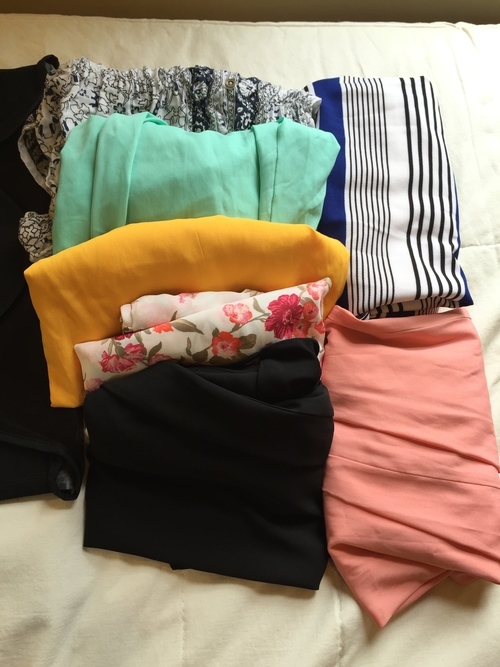 In a packing envelope I start to neatly fold my more fancy, delicate clothes like dresses. To guide me I use the folding instruction board included for even folding each time. It is recommended to alternate the directions in which the collars of your garments are placed to distribute the bulk evenly. I cover shoes by placing them inside a shoe bag, shower cap etc, to protect my items from their dirty soles. Products like shampoo, conditioner, skincare or anything that comes in a bottle, I like to protect them very well. Since my suitcase is large and I will be checking it at the airport I can get away with full sized bottled products and don't have to transfer their contents into 3.4 oz containers as the TSA requires for carry-ons. To prevent your liquids from spilling, unscrew the cap, cover the opening with a plastic wrap square, place a piece of masking tape over that and screw the cap back on. Once you have done this with all your bottles, place them in a ziplock bag for extra protection. As you may know and imagine, checked luggage gets a lot of beating during airplane travels. Using Press'n Seal, place all your necklaces and bracelets on one sheet and then lay a second sheet over it, pressing to secure your jewelry in place. Then, gently roll this and place inside another ziplock bag or a cosmetics bag. My makeup, (I truly don't wear much of it) I store it inside a small cosmetics bag along with any brushes which I place inside their own separate bag (a ziplock works great) then inside that larger bag. Hair tools like my hot comb, flat iron, combs + brushes, I place inside the Eagle Creek Tube Cube, the ideal size for these longer items. I also packed my hairdryer separately. I save space by rolling the remainder of my clothes that did not make it inside a packing cube. In this case it was not necessary though. Once everything that I initially laid out is in its appropriate container, secured and or rolled I went ahead and began finding the perfect layout for them in the suitcase. Everything was so well organized that I actually had loads of room to spare. At this point I weighed my suitcase to find it was 44 pounds which is not terrible. 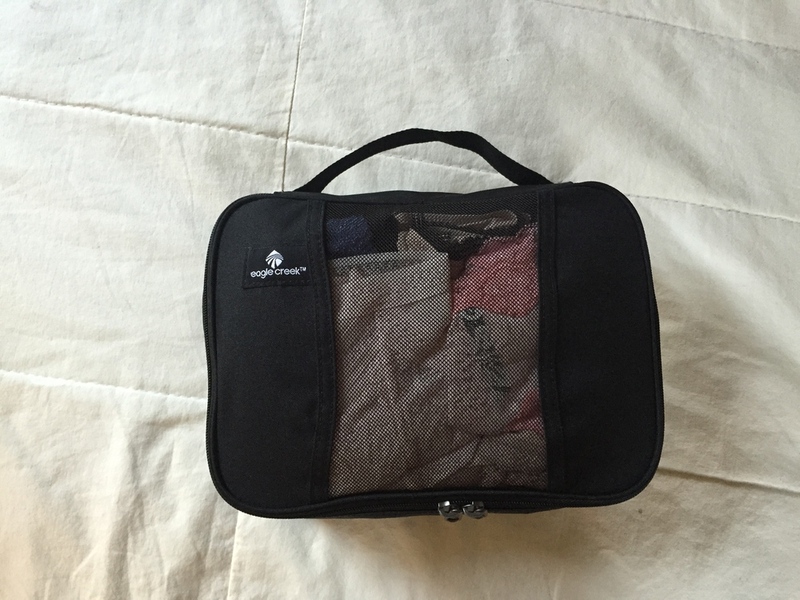 UPDATED May 22, 2015 *** If you want to save space and reduce the weight of your suitcase, pack your jeans (that are heavier) in your carry on suitcase like this... When I did, my suitcase was 35 pounds. Here is how my suitcase came along once I packed everything. Click on the play button. Just arranged the packing cubes and envelope. 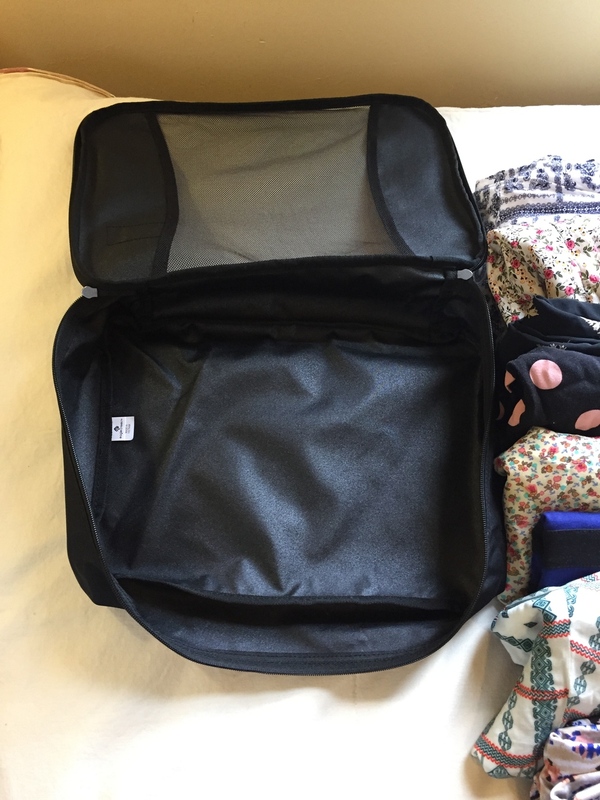 You can see there's loads of room to spare at the top (that's the beauty of packing cubes) which is great as I can still fit my shoes and hair products in here. Anything that doesn't fit (or if my suitcase is over the weight limit I will put inside my carry-on suitcase). I do have a method for packing that one too, though. I added a couple fabric refresher sheets to maintain my clothes smelling fresh for longer. What are some tips and tricks you use to pack your suitcase?